The Women’s Army Auxiliary Corps (WAAC) was one of several voluntary women’s organisations at the front, providing vital support to military forces in the final years of the war. Women’s labour contribution to the war was well established in certain fields by 1916. With male munitions workers at the front, roughly one million women worked in the factories. 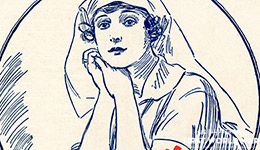 A further 40,000 women served as nurses during the war, primarily through Voluntary Aid Detachment, receiving nominal pay in return for their services. With its more genteel associations, nursing was a particularly popular option for women from middle- and upper-class backgrounds. The formal establishment of the WAAC in July 1917 – and the Women’s Royal Naval Service (WRNS or “Wrens”) in December and the Women’s Royal Air Force (WRAF) in April 1918 – marked a new phase in women’s war work. These were uniformed paramilitary organisations that worked at or near the front, performing duties such as driving, cooking and secretarial work. The WAAC was already sending its first members to the front in March 1917.The Women’s Land Army, established in July that year, recruited women to replace the male agricultural workers who were fighting overseas. Our photos give ocular proof of their capability… motor drivers and nurses running energetically to their Red Cross ambulances… women working hard in a women-carpenters’ workshop. Advertisements placed in these publications testify to the appeal of this war work. Companies promoted their raincoats, boots and soap using images of capable, energetic femininity: “No gift is more acceptable to the outward-bound WAAC girl”. Other companies, such as Chivers, sponsored recruitment advertisements in The Illustrated London News. In total, approximately 80,000 women served in these paramilitary organisations, with a further 20,000 in the Women’s Land Army. While considerably smaller than the number of female munitions workers, these organisations did vital work in the crucial closing years of the conflict, and provided a high-profile image of women in the war.